One evening on a grassy hill, under an acacia tree, near the banks of the Zambezi River a lioness gave birth to four cubs. The mother had been a member of an immense pride of over twenty lions, but poachers had captured most of her kin. Now she and her sisters and these four cubs were all that remained. The sun and the moon crossed over the sky many times. Seasons changed. The little cubs learned to walk, and to run. They learned to play and be in the world on the grassy hill under the acacia tree near the banks of the Zambezi River. The mother lion taught here cubs that lions are good hunters, and good hunters follow their prey, but stay with the pride. So begins The Lion Who Sang with the Birds, a fable about following your inner voice. This fable is told by a narrator, Gudo the Baboon, over the magical, musical composition of Randy McIntosh. 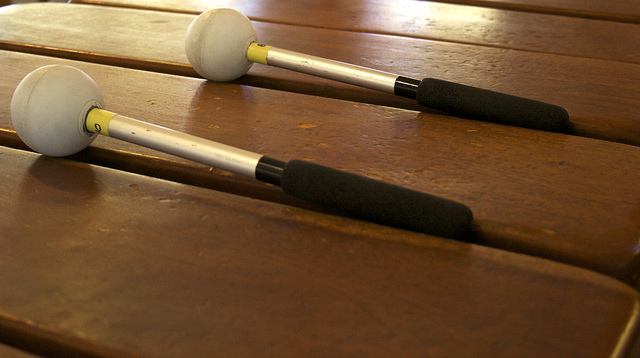 Marimbas represent the lion pride: the mother lion is the tenor marimba, the first-born cub is the soprano marimba, the second-born cub is the alto marimba, and the third-born cub is the baritone marimba. These lions all act like typical lions. They hunt and sleep and spend their time together. The marimbas that represent the lions all can be played alone, but sound best when played together, just like a pride of lions working together on a hunt. The fourth-born cub is a little different than the rest of the lions and is therefore represented by a different African percussion instrument. The fourth-born cub is the djembe drum. His drumming represents his singing, which is what this lion spend his time doing rather than hunting with the pride. The birds in the tree are represented by the alto saxophone. Everyone knows that a lion sounds nothing like a bird, just like a djembe sounds nothing like a saxophone. But if you listen carefully as the fourth born cub learns to sing, they begin to sound more alike and very nice together. Other aspects of the fable are also symbolized musically. A gong is the lion’s roar. Cymbals and tom-toms are the lions squabbling. A shekeree is the angry bees. Chimes are the symbol of magic and hosho are the symbol of Gudo’s imagination. This musical production was written after the birth of Randy’s daughter in 2007, and is his gift to her as his encouragement to follow her own song. Randy’s musical The Lion Who Sang with the Birds was performed several times at both the Nomad Theater in Boulder, Colorado in April 2008 and The Union Colony Civic Center in Greeley, Colorado in September 2008.